ISLAMABAD – Moonis Elahi has challenged the Supreme Court’s decision for reassigning NICL case investigation to Federal Investigation Agency (FIA) officer Zafar Qureshi. 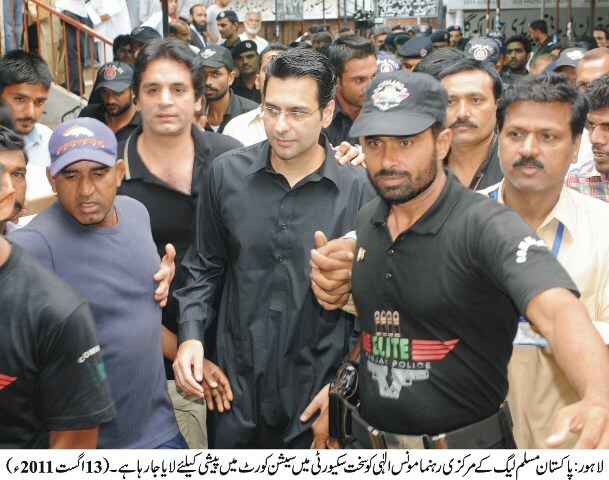 Moonis Elahi, who is a PML-Q leader and son of Ch Pervaiz Elahi, is the main accused in the National Insurance Company Limited (NICL) scam. On Thursday, he filed the review petition through Babar Awan against the apex court’s decision to repost FIA Additional Director General Zafar Qureshi in the multi-billion rupee scam. The sources told The Nation that former law minister and PPP leader Babar Awan, in his capacity as a counsel of Moonis, would file two more petitions in the Supreme Court in order to prevent Zafar Qureshi from investigating NICL scam. In his Thursday’s plea he prayed the court to remove Qureshi as head of the investigation team, claiming that Qureshi may not investigate the case impartially because on February 17, 2011 he had filed a written statement at the Supreme Court stating Moonis Elahi was threatening him. Therefore, it was unlikely that Qureshi would conduct an unbiased investigation, he added. Babar contended that the court had reposted Zafar Qureshi to investigate NICL case without hearing his point of view which was against the interest of the justice and Article 10A of the constitution. He pleaded the court to admit his review petition for hearing his stance. He said his client has expressed confidence in all the members of the investigation team except Qureshi. The counsel also requested that the court should stop the investigation of the case till the decision on review petition. The court on August 8 had quashed the federal government’s order regarding the suspension of FIA ADG Zafar Qureshi and directed him to resume NICL probe forthwith and complete the inquiry expeditiously. 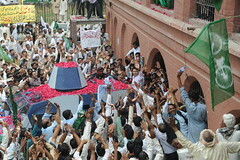 Lahore (August 18, 2011) The hearing of Moonis Elahi’s acquittal petition in the NICL case has been adjourned to 6 September on the request of Additional Director General FIA Zaffar Qureshi. Today as soon as the NICL case hearing began in the court of District Judge Mujahid Mustaqeem, FIA’s Zaffar Qureshi moved a written request asking for a one month adjournment. The learned judge after a short suspension of proceedings accepted Zaffar Qureshi’s request. 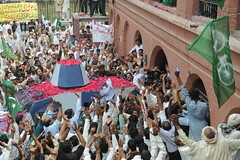 On this unexpected decision, Moonis Elahi’s lawyers argued that the adjournment of the acquittal petition was a clear violation of the written order dated 18 May 2011 of a three member Supreme Court Bench headed by Chief Justice Iftikhar Muhammad Chaudhry according to which the courts were fully independent in trying Moonis Elahi and they were not to be influenced by the trial of the NICL case in the Supreme Court. The said order was issued on the request that Moonis Elahi was not getting his due legal relief because the NICL case was also being heard in the Supreme Court, further argued Moonis Elahi’s lawyers. Rai Bashir Ahmed advocate arguing in the court said that in his 40 years of legal experience never before had an investigation officer ordered the court to grant him one month period for investigation. The investigation officer of the said case is Chaudhry Ashgar who is still to appear in the court, pleaded Moonis Elahi’s lawyer. He further pleaded that Zaffar Qureshi had deliberately misinformed the court about being unable to complete the investigation due to his transfer on April 18, 2011. He argued that Zaffar Qureshi on March 21, 2011 had informed the honourable court of having completed investigations in two cases and of submitting final case challans. He said that the court should take action against Zaffar Qureshi for furnishing false information to the court. Moonis Elahi’s defence lawyer accused the FIA of turning the case into a personal feud after failing to bring up anything against his client. Later talking to the media, Moonis Elahi’s team of defence lawyers said that they would contest today’s decision right up to the Supreme Court. They particularly pointed out at the honourable judge’s unwarranted suspension of today’s court proceedings twice for 10 and 45 minutes respectively and for staying in the retiring room without specifying any reason. 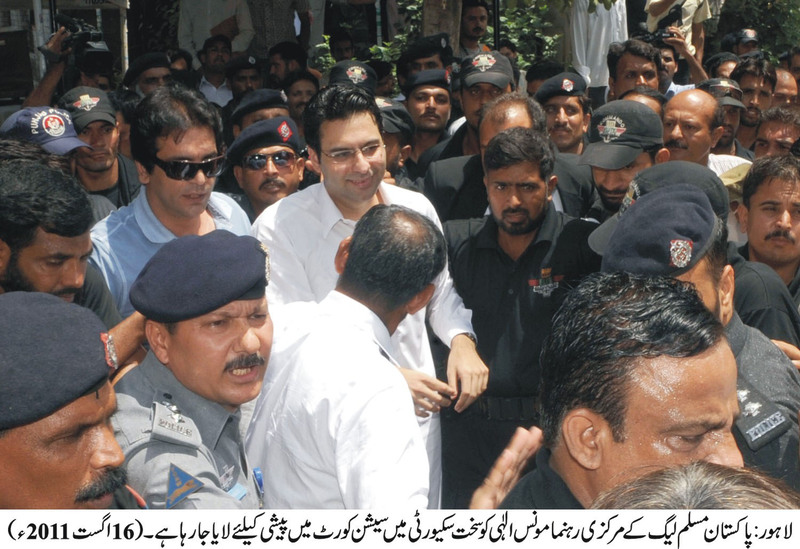 Earlier, Moonis Elahi was brought amid tight security to the court. 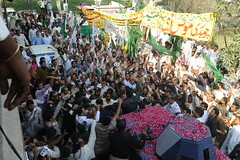 A large number of PML workers had come to show their solidarity with the incarcerated leader including Abdullah Yousaf Warraich, Aamna Ulfat, Samina Khawar Hayyat, Seemal Kamran, Umer Farooq Dar. Hearing of the National Insurance Corporation Limited (NICL) scam against Moonis Elahi and others has been adjourned until August 18 as the judge concerned, Mujahid Mustaqeem, is on leave. On Tuesday, counsel for the Federal Investigating Agency (FIA) had to record arguments before District and Sessions Judge Mujahid Mustaqeem on an application filed by Moonis Elahi, seeking his acquittal in the case under 265-K of CrPC. 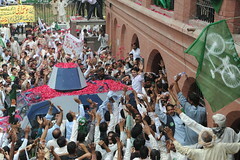 Mian Nawaz Sharif’s statement on the eve of Pakistan’s 65th Independence Day, pronouncing the Indian gods and culture similar as that of Pakistan is not only a sinister move to undermine the Two Nation theory but also a deliberate attempt at nullifying the sacrifices of countless Muslims for the creation of Pakistan. It is apparent from his views that the Indian contract for weakening Pakistan’s ideological foundations has been awarded to “Sharif Brothers & Co” who have their head offices located at Jaati Umra of Amritsar, India and their sub-office at Jaati Umra, Raiwind. 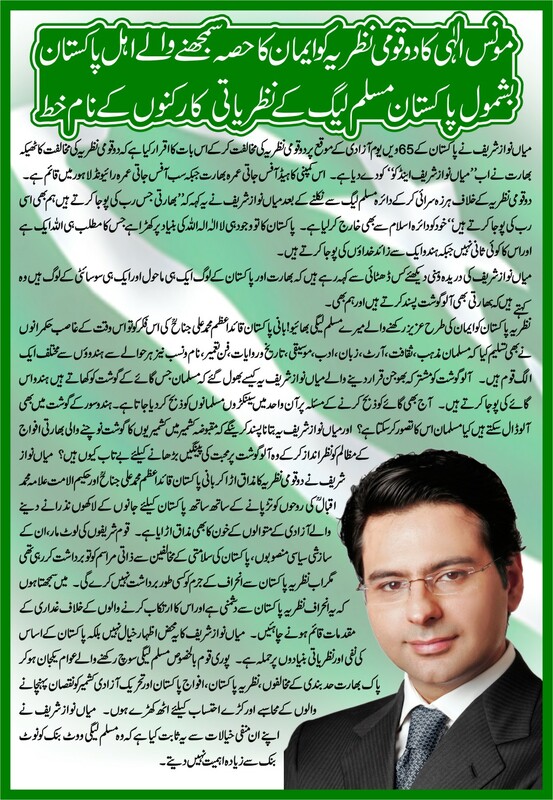 It is a great historical fact and an undeniable reality that Pakistan was created in the name of Islam. The Muslims of the Sub-continent struggled for independence under the leadership of the Quaid-e-Azam Muhammad Ali Jinnah to live in a society that believed in one God unlike the Hindus who worshipped several gods and goddesses. “The Muslims are a separate nation from the Hindus. Our religion, history, culture, architecture, ways of living and eating habits are diametrically opposed to them”, said the Quaid. But today, a Pakistani politician who claims to head a faction of Muslim League (the very party which founded Pakistan) has the audacity to challenge the very ethos of Pakistan. What a shame, and that too at a time when the nation is going through the toughest period in its history. Ironically, in the same speech delivered before his Indian guests, the self-styled “amir ul momineen” while enumerating the similarities between Muslims of Pakistan and the predominantly Hindu India identified the dish of “potatoes and meat” (aalu gosht) as one great similarity. One does not have words to condemn this most fickle exercise at finding commonalities between the two most diverse faiths and nations. If “aalu gosht” is what MNS considers as a binding force between India and Pakistan then he should have kept in mind that the meat Indians relish the most is that of the innocent Kashmiri Mussalmans. The founding fathers of Pakistan must be turning in their graves at this most preposterous and horrific statement made by a Pakistani politician. We, Pakistanis have suffered tremendous political and financial blows at the hands of Sharif Brothers and Co and they have been getting away with them, but this time round it will be unpatriotic to let them go Scot free. It is now time to put Nawaz Sharif in the dock and the charge should be of staging treason against the Ideology of Pakistan and hatching a conspiracy against the people of Pakistan. I will end my statement with words of a senior Pakistani journalist known for his patriotic views who said “if Nawaz Sharif has such soft corner for Hindus then he should shift his Jaati Umra residence to Amritsar”. LAHORE: District and Sessions Judge Mujahid Mustaqeem adjourned till August 16, the hearing NICL land scam case of Chaudhary Moonis Elahi as his counsel completed arguments on acquittal application of FIR no 46/10 on Saturday.Appearing before the court Advocate Amjad Pervaiz the counsel of Chaudhary Moonis Elahi accused of National Insurance Company Limited land scam argued and tried to prove that Moonis Elahi the son of former Chief Minister Punjab Chaudhary Parvaiz Elahi had nothing to do with the land scam of NICL. He argued that all the witnesses of the case who had recorded their statements against Ch. 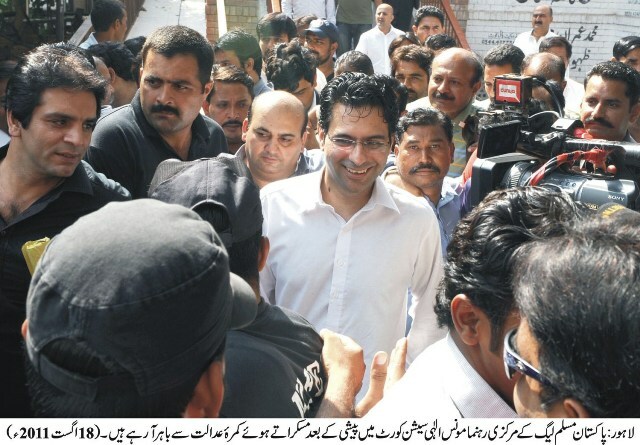 Moonis had denied any sort of involvement of Moonis Elahi in above said scam. He argued that the letter written by Deputy Director FIA to the director FIA about any role of Chaudhary Moonis Elahi in the scam revealed that Moonis was not involve in it. 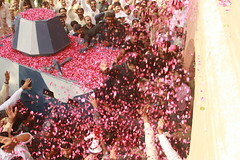 Pervaiz Said repeated all the arguments put in front of special magistrate of banking court Malik Abudur Rasheed.He said that the statements recorded under section 161 of Penal code could not prove allegations leveled against Moonis as they all refused to say anything which could identify implication of Moonis in land scam of NICL.‘Total amount was paid back to NICL’ he said, adding that ‘admittedly there is no allegations neither I nor my family gave him instruction to transfer said money and admittedly at the time of occurrence of NICL scam neither I nor my family held the portfolio in the management of NICL’. 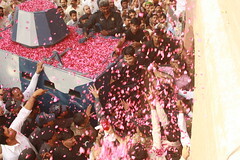 He further said that the statements of PW4 in case and IO of the scam had so much significance which showed that the case against Moonis was case of no evidence.A number of people including lawyers, media men and supporters of PML-Q leader Chaudhary Moonis Elahi were present in the court. Proceeding started at 12:20 pm and continued for almost two hours. Amjad Pervaiz, the counsel of Chaudhary Moonis Elahi fought well and put every thing related and to the point about the case to prove that his client was not involved in it but FIA got him involved on malafied intentions. He completed his arguments on the case based on FIR number 46/10.The Judge adjourned the hearing till August 16 and FIA officials would appear and argue on the case.